How does a plant grow before photosynthesis is possible? During photosynthesis, a plant translates CO2, water and light into O2. I assume the carbon C is further used for the growing process. I wonder how the plant grows before the time where photosynthesis is possible, i.e. before there are even leaves, in which photosynthesis occurs. To what extent does the plant grow from the seed/the minerals in the ground? How much carbon are relevant for which parts of the plant and at what times of the evolution of the plant? I don't know if there are only these life periods of the plant, i.e. if there are other major biochemist-of-growing changes, than in the comparison before and after the plant got leaves. So are there other relevant aspects to this? If there are leaves present, is the rigid structure of the plant only coming from the CO2 in the air and not from the ground anymore? What are typical characteristics of different plants in this regard? I.e., how do common species of plants manage their C consumption before (and after) the development of leaves? First, to correct your initial word equation: During photosynthesis, a plant translates CO2 and water into O2 and carbon compounds using energy from light (photons). You are correct to assume the C is further used for the growing process; it is used to make sugars which store energy in their bonds. That energy is then released when required to power other reactions, which is how a plant lives and grows. C is also incorporated into all the organic molecules in the plant. Plants require several things to live: CO2, light, water and minerals. If any of those things is missing for a sustained period, growth will suffer. Most molecules in a plant require some carbon, which comes originally from CO2, and also an assortment of other elements which come from the mineral nutrients in the soil. So the plant is completely reliant on minerals. Most plants, before a leaf is established or roots develop, grow using energy and nutrients stored in the endosperm and cotyledons of the seed. I whipped up a rough diagram below. Cotyledons are primitive leaves inside the seed. The endosperm is a starchy tissue used only for storage of nutrients and energy. The radicle is the juvenile root. 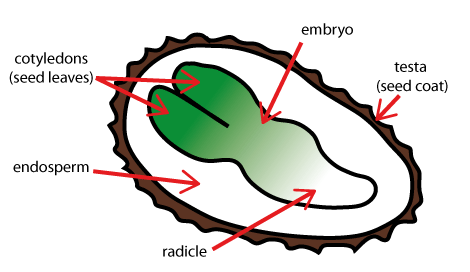 The embryo is the baby plant. When the seed germinates the embryo elongates, the endosperm depletes, the testa ruptures, and the cotyledons emerge from the seed. The cotyledons are green, and like leaves can photosynthesise, so as soon as they are in the light the plant is able to make carbon compounds. The radicle elongates at the same time, and becomes the root, so the plant is very quickly able to obtain fresh nutrients from the soil (or whatever it's growing in). At all stages of a plant's life it is using both energy stored in carbon compounds (from CO2) and nutrients which it took up via its roots. At no point does the plant start to depend solely on the CO2 in the air for its growth. You are right that the way in which plants acquire energy and nutrients prior to leaves and roots being established varies between plants. Above I outlined the way most plants use. But there are lots of variations. For example, orchids have very tiny seeds, some barely visible to the naked eye, like specks of dust. They have no endosperm or storage tissue, so they have to rely on a symbiotic mycorrhizal fungus to get carbon and nutrients. The fungus grows through the coat of the orchid seed, then provides everything the growing plant needs until it has its own leaves. Then the orchid repays the fungus by providing sugars. There are lots of other examples, but we could go on all day! Not the answer you're looking for? Browse other questions tagged biochemistry botany plant-physiology photosynthesis or ask your own question. How deep in the soil can a seed be placed and still develop into a plant/tree? Do plant-animal cross races exist? What does “chlorophyll photosynthesis peak” mean in relation to photon wavelength? How do CAM plants keep stomata closed by day and open at night? “CO2 is plant food” - What is the actual effect of increased CO2 on plant growth? How much oxygen does a plant use up at night? Can plants produce oxygen at night (without light)? Where does the mass come from when you grow plants in water?